Tonight’s edition of the BBC’s Newsnight did not feature Conservative or Labour Parliamentary candidates in a debate on welfare – because the Conservative Party pulled out at the last minute, according to a tweet from Labour’s shadow Work and Pensions secretary, Rachel Reeves. The reference is obvious – David Clapson is the benefit claimant whose case was raised by Andrew Marr in his interview with David Cameron on Sunday. The interview caused outrage among members of the public and now we can see the Conservatives’ reaction. raising awareness of the Tories’ persecution of the vulnerable. Cameron should be made to answer questions on welfare,it’s an important subject and Cameron is the current PM .and the people demand answers.If Milliband can be bullied so can Cameron. Miliband has pretty much proved he can’t be bullied, though. The Tory welfare reforms were widely welcomed at face value, people thought ‘Yes no more scroungers getting my hard earned tax money’. That was until the public actually realised the damage the reforms were doing to very vulnerable people in our society. I am glad to say that general public now seem to think the reforms were a step too far. So in short I totally agree with you Steve. However, we mustn’t forget IDS and his role in the reforms. Welfare should be the fore front of all three, but as usual it’s NHS, every time a GE is due we end up arguing NHS? Rachel Reeves, back in 2012, when Tories revamped their ‘Workfare’ stated that Labour would be ‘tighter’ than Tories on Welfare? Under the TTIP, that all 3 main parties want to sign, even though they don’t know what’s in it, we all become slaves, as the ‘Workfare’ is fully implemented. At present it only applies to certain unemployed people, under TTIP, it will be applied to all, as Welfare is dropped and they introduce their new scheme. 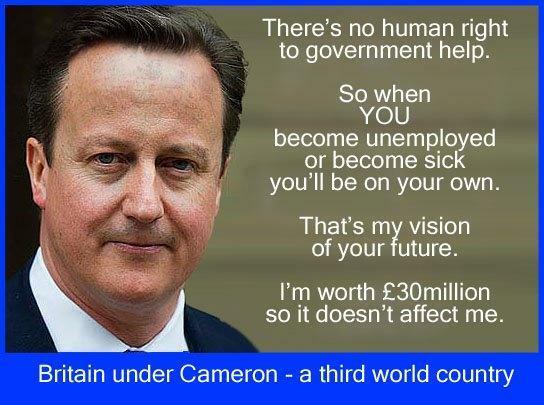 Everyone [sick & disabled] will be required to work for minimum wage topped up with ‘credits’, – No Work = No Credits? This is why the EU insist on ‘Free Movement’ or should that read ‘Cheap Labour’? Please don’t try to kid us that you don’t know Rachel Reeves meant the causes of welfare – the contributory factors that end up forcing people into a position where they have no choice but to sign on. You seem very confused about TTIP. I’ve seen no implication that it would be used to spread Workfare – especially as Labour would abolish Workfare and replace it with the jobs guarantee. The Conservatives believe that nothing is good enough should you become ill, disabled, unemployed or elderly and not rich. Fraser Nelson needs tying to a chair, his mouth taped shut, his eyes taped open and shown the reality that is the deadly disaster of the Tory Welfare reforms. Tony Dean do we know each other? I don’t understand why Reeves pulled out? Surely she open goals galore if she was unopposed by anyone from government? I think she would not have been allowed to go on alone; broadcasters have to give equal coverage to the main parties during an election. They are obliged to ‘offer’ but if that offer is rejected, what’s to stop them continuing without? No, they are obliged to give equal coverage; otherwise they are giving one side an unfair advantage over the other. My main contact at the BBC isn’t surprised by the full list of deaths that i supplied her with from the Facebook blog remember the dead. She said thanks as always but take care of yourself. Thank you – well done!! It is a hard slog when the journalists are not doing their job but thanks to courageous, amazing people like you, and Mike and everyone, things are changing!!! BBC aren’t the only journalists who have ‘failed’ in their duty to provide and investigate! Gordon Bowden, an ex RAF Engineer, has done some blinding work, and on 1st March 2015, passed some of his evidence on to BBC, in a very Public display. Consequently, the hierarchy are ‘trembling’ in their boots! The Tories will always run to the highest bidder notwithstanding their integrity and run away when things don’t go their own way. Remploy was set up in 1946 by the then Labour Government to help people with physical and mental disabilities in their everyday lives. It has helped over 25 million people. When the Tories came to power in 2010 one of the first cuts they made was Remploy, then disability payments followed by the bedroom tax. These cuts have been made by the most privileged government in my memory, financed by the wealthiest in the land, hitting the most vulnerable. If this is what we want and more of the same vote Tory in the forthcoming election. It says a lot about the country we have become. I cannot believe that the Tories have so far avoided all real discussion and responsibility for their crimes against the needy. I also cannot believe how few people are aware of it, or even care. I can only hope that at some point the dam breaks and the Tories behind the reforms, and those “just obeying orders” all called to account for their crimes. Cameron is a parasite, he cares for nobody but his own kind, 1 million using food banks, the disabled getting thrown off benefits with Atos which are kangaroo court rooms and the poor having to pay the bedroom tax this man needs to go. As I read this, a graphic popped up on the silent TV showing the Tories with a majority. I felt physically sick & scared, and I’m relatively lucky in my circumstances. What will happen if so? I fear for those who have stoically & unwillingly withstood the WCA & pressures and financial hardships and vilification and sheer bloody nastiness. No-one can withstand this forever. But Nick pointing out that the (so-called) journos at the BBC claim to be unaware of the plight and deaths of so many leaves a sour taste. IF the media & BBC were drawn from a more representative population and IF they were doing their jobs, and IF they had the slightest interest in politics, or society or anything going on – like the 10,000 strong march that started out from Broadcasting house (ffs) – then they SHOULD have known. Shame on them, and I hope they realise that THEY have played a part in each & every death by compliance by silence of the media. 28 minutes into Newsnight Fraser Nelson said ‘The Government Doesn’t Take any Pleasure in Cutting People’s Welfare, but you do it to Save Lives’ What planet are these muppets from? They haven’t an ounce of commonsense between them. I think slowly Britain is ‘waking up’. Let’s pray it’s not to late to change a great many people’s lives for the better!